Admiral General Aladeen (Sacha Baron Cohen), the dictator of the fictional North African country of Wadiya, is forced to go to New York to address the United Nations after a US-led NATO air strike threat. A few hours after landing on American soil, he is betrayed by his uncle Tamir (Ben Kingsley), who hires an American hit man posing as a bodyguard (John C Reilly) to secretly get rid of his nephew. With his beard gone (making him unrecognizable) and a half-wit double taking his place, Aladeen wanders around New York and is befriended by an activist named Zoe (Anna Faris), an anti-Aladeen American activist who is fighting for Wadiya’s transition to democracy. This is one of, if not, the most insensitive movie I have ever seen. Baron Cohen goes all the way, hitting almost every possible demographic out there. You will find everything here from racial slurs to religious tirades and all the way down to gender biased statements that make up the film’s dialogue. 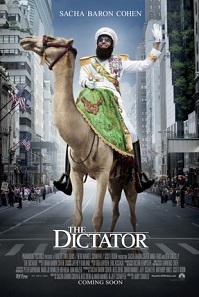 Unlike Borat or Bruno, which used some sort of pseudo-documentary style of storytelling, The Dictator is shot as a feature movie with a plot, glossy cinematography, familiar supporting actors (Anna Faris), and some cameos here and there (John C Reilly, Meagan Fox, and Edward Norton, among others). Is it funny? This is the hard question. For a movie like this, it is really hard to do a review without getting into trouble and without being consequently judged. Besides, despite its nature as a spoof, what it parodies is a very real issue that has sparked many a heated debate all over the globe. People are actually suffering from such cruelties that a dictatorship brings about. If you say that you enjoyed this movie or it made you laugh, people would brand you as insensitive. Well then, I laughed. I laughed out loud. And I was not the only one. Perhaps it is because the focus is taken away from the sufferings of people living in totalitarian rule. Instead, the story concentrates on the misadventures of the central character in an environment that is alien to him, giving the audience the typical fish out of water scenario that is almost always a hit formula. For my defense, let me reiterate that this is just a movie from someone who has already done two similarly offensive films before. It is not for mandatory viewing and everyone is already aware of what brand of comedy is going to be on offer. To go and watch this and expect not to be offended at the very least is, in a way, like getting a loaded gun, shooting your foot, and expecting not to even say “Ouch”. And so yes, the comedy in this film lies in the crudeness of the dialogue, the absurdity of the plot, and the cheesiness of the love story that eventually develops. If you enjoyed the Scary Movie and Austin Powers series, then the type of comedy employed is almost the same, except that as already mentioned, everything here is more provocative in many ways. Perhaps the bonus you are going to get is the unlikely critic of democracy and dictatorship. Aside from the satirical speech that the protagonist gives in the end, you also get to observe the many pros and cons of either political system through subtle clues from what is happening in the background. In the end, you might even think that it is actually a parody of both. In a way, it is. One more thing that I would have to praise is the Wadiya palace used in the film. Whether it is a real palace or just CGI is irrelevant. It is an awesome piece of architecture that is just so pleasing to the eyes, golden domes and all!